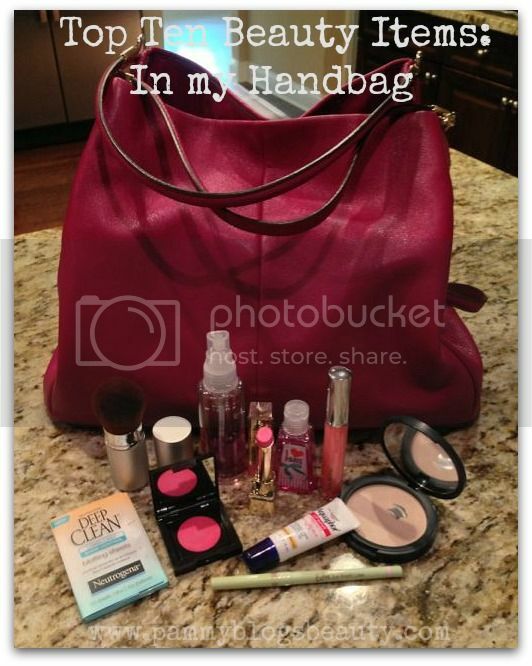 Pammy Blogs Beauty: Top 10 Tuesdays: Beauty Items in my Purse! Top 10 Tuesdays: Beauty Items in my Purse! Top 10 Tuesdays is the blog series for List lovers! Top Ten Tuesdays are a bi-weekly collaborative link-up series where top Beauty Bloggers share their Top 10 Lists for a given topic. This week: Top 10 Beauty Items in my Purse!!! I can't dive into listing my beauty items in my handbag before raving a bit about my bag! My go-to purse for the past 3 months has been my Coach Madison Phoebe Leather Shoulder Bag. This gorgeous bag was a surprise birthday present from my husband. He basically told the salesperson at Coach that I was a mother of a toddler and that I needed a large bag. The Madison Phoebe in Cranberry was what they decided upon. I love the gorgeous magenta color and the spacious compartments. This bag is supple and soft. The cranberry color is so versitile. Honestly, this bag is a gorgeous pop of color and I am amazed at how it goes with practically every outfit!!! This is the perfect "Mommy Bag"! I can even fit a few diapers and a travel wipes container inside. The inside features 3 main compartments: a small middle zipper compartment which is perfect for the wallet, keys, etc, and two large and tall side snap top compartments. I have loosely organized one side as the "kid" side and one side as the "me" side. My side has my makeup, brush, phone, etc. The "kid" side holds the diapers, wipes, and a couple toys or snacks. The Madison Phoebe served me well throughout Summer and this color transitions perfectly into Fall! Neutrogena Deep Clean Long-Last Shine Control Blotting Sheets: Blotting sheets are an absolute must-have for girls on-the-go! You can instantly remove oil and shine without disrupting your makeup just by pressing these on your face. Essence of Beauty Secret Woods Fine Fragrance Body Mist: I am body mist obsessed. I have a bit of a phobia of getting sweaty or stinky in public. So, I refresh with body mists throughout the day and always carry a travel size one with me. My current favorite is the super-affordable Essence of Beauty Secret Woods (which is a total dupe for Bath and Body Work's Twilight Woods, which I also love). The scent is so perfect for Fall and is such a warm and lingering scent! Neutrogena Shine Control Powder in Invisible: This powder is fabulous! It does just what it says: controls shine. My skin has been super oily with pregnancy and this is certainly my go-to powder. Great for setting my makeup in the morning and for touch-ups throughout the day. I literally never leave the house without a powder in my bag! L'Oreal Colour Riche Caress Lipstick in Cotton Pink: I usually carry around at least 5 or 6 lipsticks (lol, I know...excessive!). This one is my current favorite of my purse lipstick assortment (and really the only one I need to carry). Cotton Pink is the perfect princess-y pop of medium pink. I love how light and moisturizing this lipstick feels. It gives great color to your lips and instantly perks me up! Laura Mercier Creme Cheek Colour in Rosebud: OMG! I adore this blush! It is the perfect medium-barbie pink blush. I actually can't believe that I haven't given this one a full review just yet! It truly is one of my all-time favorites. I love a cream blush for on the go as application is so easy. Just swipe on with your fingers! Aquaphor Lip Repair + Protect SPF 30 Lip Protectant: This lip balm is so hydrating!!! It is my current favorite and I keep little tubes of this everywhere...bedside table, kitchen, desk, and yes...my purse! It instantly hydrates and smooths my dry lips. Plus, it has SPF! Love, love, love it! Trish McEvoy Lip Gloss in Irresistible Petal: Like with lipsticks, I usually keep a handful of glosses in my purse. This gloss by Trish McEvoy is my favorite amongst my purse assortment! It is a sheer and shimmery hydrating pink high-shine gloss. It is comfortable and smooth on the lips. Love everything about it! Pixi Extra Eye Bright Liner: I always look tired. I use great makeup to combat my dark circle problems (allergies, lack of sleep, heredity). This brightening eye liner from Pixi is fabulous! I just sweep it in my inner eye corners and on waterline to instantly look more awake! I apply throughout the day when I freshen up! Bath & Body Works PocketBac Anti-Bacterial Hand Gel: OMG! What did I ever do before anti-bac hand gels? lol! I always have one of these in my purse. They smell great and instantly sanitize your hands. Germs...yuck! Shop the Post: Here are all of my purse beauty favorites!!! I love your picks, but I really love your purse. Compartments are key!!! It's weird looking inside people's handbags! Love that LM! @Jessika-Thank you! :) So true. Compartments make the purse for me! @Beauty411-lol, i suppose you are right! I NEED to try that Pixi liner! Gotta love the cute PocketBacs! I have at least 3 different pocketbacs rolling around the bottom of my purse. Don't know what I'd do without them either. Ooo, I love the looks of that Laura Mercier blush! I love your purse. And I laughed when you said "my purse assortment". I have lippies that live in my purse and rarely make it to my vanity. But they get more use that way. @Prime Beauty-You will love it! @wehearthis-The LM blush is awesome!! !